As you will know if you’ve been reading this blog I don’t like today’s Montblancs (mainly because of the awful hype and the ridiculous overpricing) but I do like the older ones. Mostly, the ones that I like are from the 50s or earlier and they are piston fillers. The Generation is not a piston filler; it’s a cartridge/converter pen but a very likeable one. It’s quite a big pen at 14 cm and it has a smooth and pleasing outline without much in the way of bling. It has gold plating (in very good condition) on the clip, at the base of the barrel and on the thin and medium cap rings. I’ve been unable to find the dates of this pen. I would guess at the 90s but I might be wrong by a fair bit – it might be older. It has a push fit cap which closes the pen with a very satisfying snap. 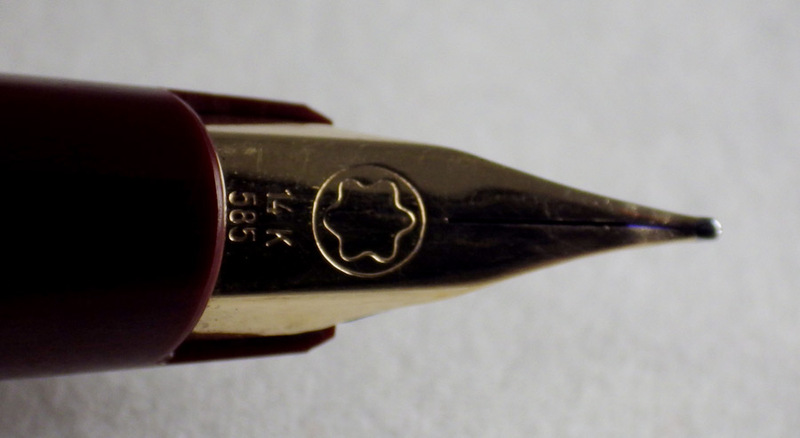 The nib is not what you would think of for Montblanc. I’m much too lazy to attempt to describe it but you can see it in the photograph. It’s actually an absolutely superb nib, such a pleasure to write with. Montblanc may over praise and overprice themselves but they do make splendid nibs. That, and the prestige that many people imagine it confers upon them to have one, is what makes them such big sellers. Now me, I’m not looking for anything to confer prestige upon me and I don’t believe it really would anyway, so I just assess the pen as I would any other and it comes out as a terrific pen. Not as good as the best Swans, of course, but a really excellent example of the best post-war pens. So there we are – yet another Montblanc that I approve of. Unfortunately, of course, they are very expensive – even the older ones. Otherwise I would buy many more of them. There is obviously quite a lot of “the Emperor’s new clothes” about Montblancs and, indeed, some other modern pens like Visconti. However, it is worth saying that any Montblanc you buy, even the cheapest ones (back when they made cheaper ones), will have a thoroughly splendid nib. By comparison the one Visconti that I had was nothing special in that regard and in fact I might have been writing with a cheap Chinese pen because it was so heavy and the nib so lacking in character. I never dreamt the day would come when I would be boosting Montblancs in my blog but here it is! I do recommend that you stick to the cheapest ones you can find and please avoid paying thousands for the perishing things! Thank you for writing about the Mont Blanc generations. Like you, I am not particularly enamoured with Mont Blanc and have not collected them for the self same reasons you describe, but I own this pen and really like it. It was an anniversary present from my wife, from the very early 1990’s so your estimation is pretty much spot on. It writes beautifully and have never had any problems with flow, it has always been a reliable writer. I don’t use it much nowadays as I prefer to use some of the older Watermans or Parkers I own but was pleased to see such an informative article on what I think is one of the cheaper but underrated Mont Blancs, (perhaps it is underrated because it is cheaper! ).